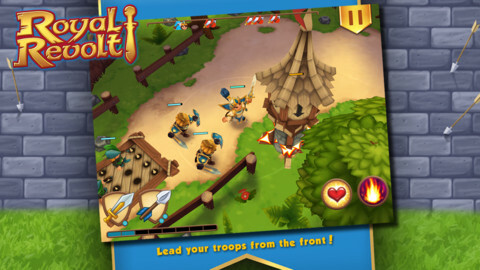 Reclaim a kingdom in this satisfying strategy combat title. We have strategy games a-plenty on our mobile phones, ditto a fair selection of tactical action games, but our eyes are always caught by a game that combines pre-planning and on-the-fly thinking with some deliciously meaty third-person combat action. The story of Royal Revolt! is a simple one, as you take on the role of a prince determined to reclaim his kingdom from the clutches of a greedy and envious family. Through a series of levels, you battle through enemies and buildings, calling in additional fighters as your resources allow, while raining spell damage upon your enemies and keeping the troops revived with heals. The structure of the gameplay is broadly the same across the game's many levels. 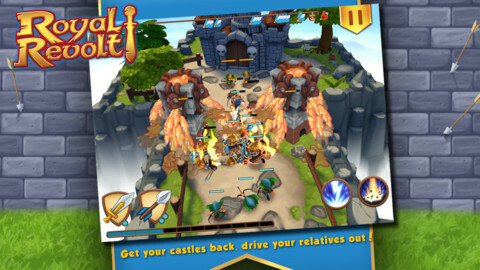 A crawl across open landscape sees your team of adventurers facing off against rabbling castle defenders, while dodging traps and battering down barricades. 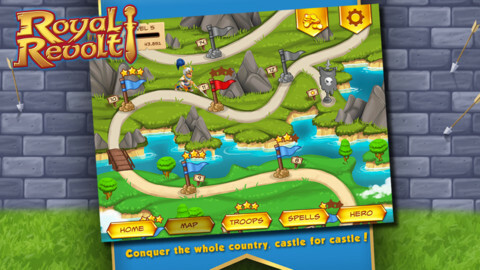 Once you've passed through this initial section, you arrive at the castle itself where you and your army (those who have survived, that is) need to make one final assault against the heavily defended keep before claiming it for yourself. In the early days of the game there's not a huge amount of strategy to speak of. Spamming the production of bog-standard warriors, and unleashing your magical and healing spells whenever they become available will get you through the first dozen or so levels rather handsomely. In later levels though it becomes critical to manage your army much more carefully: there are molten-dripping towers that benefit from an archery attack, rather than having your ground units get burned to a crisp in the process of taking it down. The various traps, which can initially be ignored as you spam the heal button, become denser, forcing you to disable them at your earliest opportunity. The enemies themselves increase in difficulty too, and you'll soon need to make very quick use of the muster button that draws all troops together, so that you can lay a frantically spammed area-of-effect heal over everyone, and whenever the cooldown for it expires. That change of pace, and the difficulty spike overall, is a little too harsh to be honest and is one area where the game lets itself down. The initial hand-holding tutorial levels, which seem a little too over-simplified, would instead make a more welcome appearance later on, when advice is needed on dealing with specific threats. 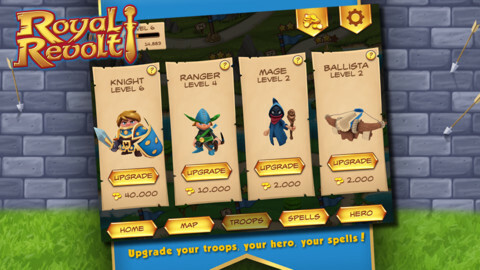 Fortunately you have a huge variety of upgrades available, whether you choose to level up your units to make them stronger and hardier, add temporary damage bonuses to your hero, or invest in new deadly spells to assault particular levels with. There are additional coins to be brought from the in-app purchase store, but a willingness to persist should see you through even the toughest levels without dipping in. Concerns about difficulty spikes aside, this is an action strategy title that packs in a depth of tactical gameplay that you wouldn't expect from the first ten or so levels. Please do persist with it though, as hardened strategy fans will find a meaty action game beneath the shallow surface. What's Hot: Slick controls, meaty action, and a generous host of upgrades and enhancements to unlock. What's Not: If you're to resist the allure of the cash store, you'll need to grind a fair few levels for your troops to be able to take on the tougher challenges.